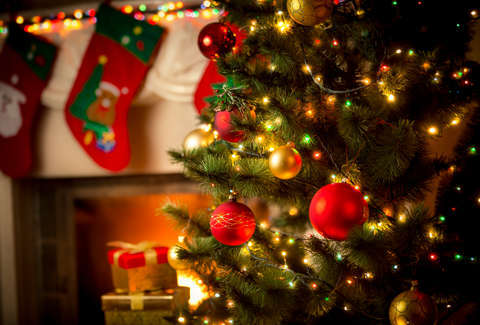 Christmas is arguably the most widely recognized holiday of them all. Whether you celebrate it or not, you get the gist: elaborate decorations, pine trees indoors, festive meals, and, of course, gifts. There’s a lot more to Christmas than meets the eye, however, and even the most festive among us maybe in the dark about some aspects of the most wonderful time of the year. Why is Christmas on the 25th? It’s safe to speculate that everyone knows that Christmas is observed on December 25, but you might be surprised to learn that it wasn’t always that way. Yeah we couldn’t believe it either. According to History, Christmas didn’t even come to be until 336 A.D., three centuries after when Jesus is said to have been born, when early Romans declared it a holiday. Better late than never. While most people hold the belief that Christmas marks Jesus’ birthday, historians say that’s totally bogus and the clues are in the nativity scene (you know, that set of figures your mom/grandma puts out every year with the baby and the cute animals). Based on the fact that Jesus was visited by shepherds and their sheep, historians believe he was actually born in spring. So why is Christmas celebrated on December 25? Church officials are said to have picked it based on a Pagan holiday honoring Saturn, the Roman god of agriculture, and Mithra, the Persian god of light, that already existed. They apparently thought that doing so would sway local heathens to hop on the Christianity train. From there, Christmas caught on and eventually grew into what it is today: a seemingly never-ending cycle during which we argue about Christmas music, anticipate the release of a festive coffee cup and try to one-up each other with our decor. Christmas may be popular, but it’s sure not easy to spell which is why you’ll often see people abbreviating it as “Xmas.” Where, exactly, did this ingenious (yet controversial, apparently) shorthand come from? Greeks, kind of. In Greek -- the language the New Testament was written in -- the word Christos, or Christ, starts with the letter X (Chi). Written out, it looks like this: Χριστός. According to Vox, Constantine the Great popularized the abbreviation at the start of the fourth century, but the Roman Emperor wasn’t using it to send well wishes to his pals, though. Instead, legend has it he emblazoned it on a military banner before a big battle against Maxentius. Although Constantine is credited with coming up with the Xmas abbreviation, it didn’t become a thing until 1021, “when an Anglo-Saxon scribe saved himself space by writing XPmas,” First Things reported. Paper was pricey back then! Anyway, the abbreviation finally caught on and made its way into the mainstream. Thank you, random scribe. Why do you put up a Christmas tree? One of the more confusing Christmas traditions is putting up a Christmas tree. Where exactly did that come from? Apparently, the practice dates back way before Christianity. The same way people who celebrate Christmas put up trees, wreaths, and evergreen garland in their homes, people used to hang evergreen boughs over doors and windows in their home to ward off witches, ghosts, evil spirits, and even disease. Who knew Christmas was so goth. Germans are believed to have started the tradition of putting full-on trees in homes on Christmas, however. When the holiday first made its way to Europe in the 16th century, Christians brought evergreen trees into their home and started decorating them. Some built Christmas pyramids out of wood and decorated those instead, adorning them with evergreen bits and candles. America was late to the party as far as Christmas trees are concerned, mostly because early settlers weren’t down with the pagan roots. They were so opposed, in fact, that in 1659 the General Court of Massachusetts made it a law that any observance of Christmas outside attending church was illegal. What squares! By the 1890s, an influx of European immigrants with a penchant for gaudy displays put an end to that, however. Americans started erecting Christmas trees and never looked back. Red and green have long been considered the official colors of Christmas, like blue and white for Chanukah and red, black, and green for Kwanzaa. The tradition comes from ancient Celtic people, Reader’s Digest reported. They decorated their homes with red and green holly plants (deck the halls with boughs of holly… suddenly it all makes sense), which they felt brought a little brightness and beauty to the world while all the other plants were dead. The tradition was originally tied to the winter solstice, however. Celtic people believed holly would protect them and bring luck to their families in the year to come. This practice eventually caught on in churches and in the homes of others, and is still something we do today. Why is it called a white elephant gift? White Elephant Gift swaps are the Christmas tradition everyone loves to hate: all parties involved pick a number to determine who gets to pick first and then other participants get to decide whether they want to keep the gift they got or swap with someone else. It’s chaos, but the festive kind so we as a society have come to (begrudgingly) love and accept it. There’s even a site with the official rules of White Elephant gift exchanges -- it’s that serious. So, what does “White Elephant” mean? Well, apparently long ago in Southeast Asia, white elephants were considered sacred because, according to Buddhist mythology, Buddha’s mother was presented with a white lotus flower by a white elephant the night before she gave birth. The majestic creatures eventually became the hot new gift for important people. The catch was that since white elephants were sacred, those who received them weren’t allowed to have them perform any kind of labor for them. As you can imagine, elephants weren’t easy to care for or maintain, which made them sort of a “burden” for their owners. Talk about ungrateful. Still, the status symbol was worth it to most people. Anyway, traders who ventured to Siam and back coined the term, which came to mean a lavish but cumbersome gift. In the 1900s people had “white elephant sales” in stores or markets, which overtime evolved into the white elephant gift exchanges of today. If you celebrate Christmas, or have been in any sort of public place around the holidays, you’ve probably heard at least one of 200 versions of the hit Christmas song, “Winter Wonderland.” The song was originally sung by one Richard Himber and includes a line name dropping someone called Parson Brown. “In the meadow we can build a snowman, and pretend that he is Parson Brown. So, who the hell is Parson Brown? As it turns out, Parson Brown isn’t a person at all. Merriam-Webster defines a parson as a rector or clergyman, more specifically a Protestant pastor, which explains the marriage line in the song. As for Brown, it appears that’s just the surname the songwriter chose for this fictional cleric. There you have it, folks. Everything you’ve always wondered, and some things you never knew you didn’t, about Christmas.